The Welder, this Norman Rockwell painting, appeared on the cover of Popular Science published April 1921. This was the second picture by Rockwell to appear on the Popular Science cover. 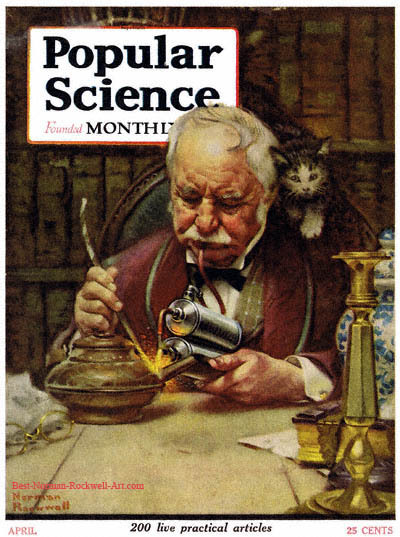 Popular Science only published two Rockwell illustrated covers, spread between 1920 and 1921. In this painting, Norman Rockwell shows us a hobby welder. The older gentleman in this illustration is repairing a brass teapot. The spout had broken off. This fellow is pretty handy. He pulled out his welding apparatus and is fixing the teapot. He is blowing through a tube to fuel the flame with oxygen. His eyeglasses lie on the table next to the work area. A couple of other projects are close at hand on the table also. In the background we can discern that the scene takes place in his library. Books line the wall. A Rockwell trademark, a kitty cat on his shoulder, completes the composition .